Six years ago Felipe Calderón declared war on the drug cartels soon after taking office by sending troops to his home state of Michoacán. Six years later the war still rages on as Enrique Peña Nieto starts his term of office, and everyone is taking a look at the legacy of the man who started the war. There are newspapers and organizations that keep tallies of drug war-related deaths, which in itself is very laudable, but drug trafficking existed long before Calderón came to office and it will exist long after he leaves. Plus, there is also the issue that the government stopped publishing data on drug war-related deaths after September 2011, and its numbers usually came out higher than the private estimates. As we saw in my last post sometimes they resemble homicides more than accidents. 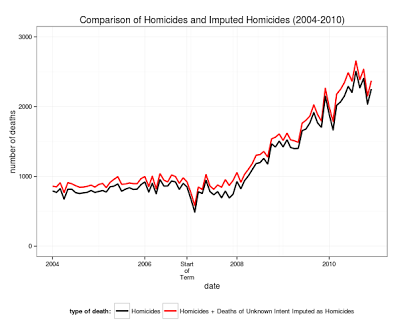 Explain some of the difference in under-reported homicide deaths when compared with drug war-related homicides. To classify deaths of unknown intent I first recoded legal intervention / operations of war deaths as homicides, I then excluded deaths that occurred outside of Mexico. Because of the anomaly in the Federal District I recoded all accidental deaths during January and February of 2007 in this federate entity as unknown. In Sinaloa I recoded accidental deaths by firearm as unknown as I detailed in my previous post. And in Baja California I set all firearm accidents as deaths of unknown intent in 2007. I still have lots of doubts about the vital statistics in Chiapas, but since it is not a state that has suffered the worst of the drug war I’ll leave it alone. 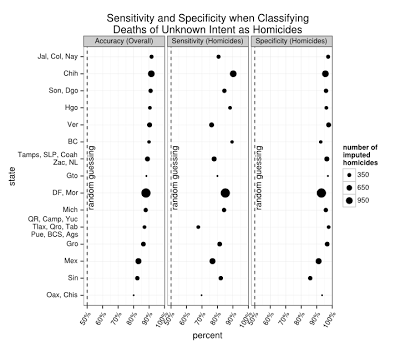 Also the mass graves found in Guerrero seem to be missing from the data (add another 100? ), but I’ll ignore it. And in Tamaulipas even including deaths of unknown intent under-counts drug war-related homicides, but again I’ll ignore it (add about another 200-400? homicides to my estimate). I could have used fancier algorithms to try and get better classification performance, but the results were pretty good and I wanted something fast. 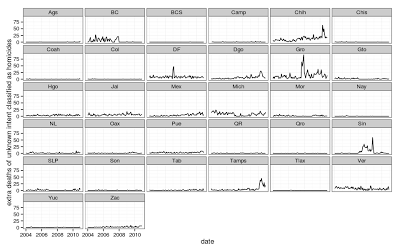 Also take into account that since I have to use the raw data from the mortality database I only have data available up to 2010. I used an ARIMA(0,1,1)(1,1,0) regression on the monthly SNSP police reports to predict the INEGI homicides + firearm accidents + the deaths of unknown intent imputed to be homicides from January 2012 to November 2012 since no vital statistics data is available after 2011. For the baseline estimate of the number of deaths I simply used the average monthly deaths from January 2004 to November 2006 (increasing at 1% per year), I then substracted or added the total number of imputed deaths from the baseline estimate (some homicides were surely prevented by the drug war in the beginning stages) to obtain the excess deaths. 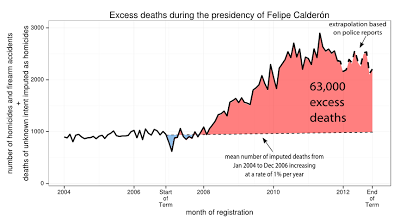 The total excess imputed homicides for the Calderón sexenio was of 63,000 (61,000-66,000 95% CI), I rounded the numbers to the nearest multiple of 1,000 since it doesn’t make any sense to report the number with much accuracy. I used data on police reports from the SNSP, but if I used drug war homicide data from Milenio I would have goten much higher estimates since deaths during the first eleven months of each year increased from 11,343 in 2011 to 11,412 in 2012. The more or less arbitrary baseline is open to criticism. According to the Secretary of Interior Alejandro Poiré they found a country “infested by rats”. Calderón supporters would put the baseline much much higher than the one I used, though I have the feeling this is just an ad-hoc justification since they never provided any evidence for this. Then there is also the fact that the government considers most of the dead to have been criminals, so we have the president (in)famously stating “If you see dust in the air, it’s because we’re cleaning house,” supporters of the war would argue that those who lost their lives in a certain way deserved their fate. Saying that Mexico was on the verge of a drug war before the president took office is not the only view since each generation of Mexicans was becoming less violent before the drug war (though with important period effects), and Mexico had had episodes of localized drug violence before in mid-ninties in Ciudad Juárez and at the turn of the century in Tijuana without plunging into a extended drug war, so maybe the baseline is set too high. I’m still missing mass graves that haven’t been found, and bodies that simply disappeared without leaving a trace. One could combine the various lists of disappeared kept by the PGR and SSP to produce an estimate of the number of missing persons in Mexico, but you would still have to match them somehow to the mortality datase since many o the dead are never fully identified. This means my estimate is a lower limit.